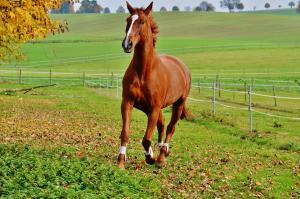 Ex-racehorses are now becoming very popular as riding horses owing to their athletic and intelligent nature. They tend to be well handled and are usually good to load, travel, shoe and clip. Often they are used to hacking to the gallops and are very good in traffic. However they do need good care and attention to maintain a healthy horse so should not be considered the "cheap option". The old saying "no hoof, no horse" is very apt particularly for the Thoroughbred. Thoroughbreds tend to have small feet in comparison to their body size therefore concentrating the load through a small area and increasing concussion. Often they are thin-walled and thin-soled increasing the incidence of bruising, corns and hoof wall cracks. They are often flat-footed with low heel conformation compared to other breeds. However with good farriery, diet and hoof care thoroughbred feet can be managed well. 4-6 weekly shoeing is recommended to prevent the toe becoming too long and the heels collapsed. Adding in a hoof supplement will ensure your horse is getting the correct vitamins to promote good hoof growth such as methionine, cysteine, biotin, iron, copper, zinc, iodine and calcium. Applying a hoof balm particularly in the summer can prevent feet drying out and cracking. Additionally reducing time out in wet, muddy conditions during the winter is preferable (although not always possible!). It is particularly important to have your ex-racehorses teeth checked by a vet or BAEDT on arrival. They are fed large volumes of easily chewed and digested concentrate feed required for their workload in racing. However, decreased chewing time means that their teeth are not worn down as they would be in a horse on a higher fibre and roughage diet. The outside of the upper teeth and the inside of the lower teeth can become very sharp causing ulceration of the cheeks and lacerations to the tongue. As with any other breed the mouth should also be assessed for any overgrowths, diastema (gaps between the teeth) or fractured teeth. Ideally your horse should have routine dentistry every 6-12 months. Problems with your horses mouth can make re-training your horse to a different discipline very difficult. Racehorses in training are typically fed a high concentrate, cereal based diet to provide the energy required to perform well with very little fibre in the diet. The bacteria in the gut is therefore adapted to digest a high starch, low fibre diet. It is important to introduce any change in diet slowly to reduce the chance of gastro-intestinal upsets. This includes access to pasture which should be increased slowly over about a month. A probiotic supplement is always a good idea but particularly at this time to maintain good hindgut function. After this period you should increase the amount of forage (hay, haylage, pasture, chaff) to 2.5% of your horses bodyweight per day (12.5kg dry matter intake for an average 500kg horse). Feeds should reflect your horses workload. TB's in light work should manage well on a low calorie pasture mix. Horses in medium-hard work would thrive on a high oil, high fibre formulation which will provide slow release energy without promoting excitability (ie Dodson and Horrell staypower cubes). If you are unsure of what to feed most of the large feed companies have very helpful nutrition advice lines to help you decide on the best diet for your horse. - Poor performance and reluctance to go forward from the leg. - Plenty of roughage in the diet. - Regular turnout at grass will help to prevent ulcers. - Frequent or ad lib provision of hay or haylage when stabled - Increasing the fibre content and reducing the carbohydrate content of feeds. - Some supplements may help to reduce signs and recurrence of ulcers.